Secretary Pompeo explained the US government’s Iran policy as a three-pronged approach. The first strategy would be to apply financial pressure on the regime. The second would address the regime’s contributions to instability in the Middle East, particularly its financing of international terrorism. The third prong would see the US supporting the Iranian public and championing their cause. The US Secretary of State was explicit in the requirements the Iranian regime would have to meet before the US would consider lifting the sanctions. He produced a set of 12 criteria that would have to be met. Among the criteria is the termination of the nuclear and ballistic missile programs, a cessation of meddling in the affairs of its neighbor states and an end to the financing of terrorism. Many of the demands Secretary Pompeo laid out have been among the demands of the Iranian opposition since decades ago to end the policy of appeasement to the mullahs in Iran, however while secretary Pompeo spoke extensively about the Iranian people and their uprising against the mullahs, the end of human rights abuses and suppression of the Iranian population was not among the 12 demands. Will the Sanctions Harm the Iranian People? When economic sanctions are employed against a rogue government, there is often a concern among the international community that rather than affect those in power, the people bear the economic burden, and are forced further into poverty and financial hardship. This is actually the narrative that the Iran lobby had long been pursuing in a bid to prevent more crippling sanctions on the regime. However, the people of Iran are in favor of the proposed sanctions. Iranian trade has not benefitted the Iranian population. The economy is under the control of the Islamic Revolutionary Guards Corps (IRCG) and the only beneficiaries of Iranian international trade are the IRCG and their affiliated companies. Under the Iran deal, the Iranian regime received a $100-$150 billion financial windfalls. This had no effect on the Iranian people, who live in worse economic circumstances than they had prior to the lifting of the sanctions. In fact, the lifting of the sanctions and extra financial revenue allowed the regime to ramp up its domestic oppression and further interfere with conflicts in the region. The people hope that with the resumption and intensification of international sanctions, it will limit the regime’s budget for repressive bodies and limit its campaign of tyranny against the Iranian population. 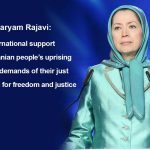 Responding to Mike Pompeo’s speech, leader of the Iranian opposition, Maryam Rajavi, called his recognition of the Iranian people’s struggle “a major step”. She added, “democratic change in Iran is the only solution to the problem in Iran and the crisis in the region. Forming an international front against the religious and terrorist dictatorship in Iran is a requisite for the establishment of peace, security and coexistence in the region and world over”. In the wake of the announcement from the US, Europe now has a choice; persevere with their short-term strategy of maintaining lucrative economic ties with Iran, or stand with the democratic movement in Iran, end its appeasement of the Iranian regime, and stand on the people’s side in their quest for a free, democratic Iran. 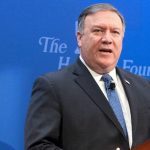 Two weeks after President Trump’s landmark decision to withdraw from the Iran nuclear deal, his Secretary of State, Mike Pompeo, used his first public message to call for a united international response to the threat posed by the Iranian regime. 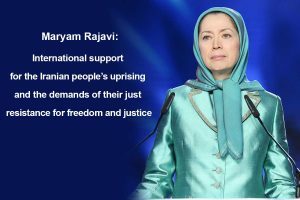 Maryam Rajavi, leader of the People’s Mujahedin Organisation of Iran (MEK) and President-elect of the National Council of Resistance of Iran (NCRI), expressed her position on Secretary Pompeo ’s speech. In his speech, Mike Pompeo outlined the reasons why the US felt compelled to withdraw from the deal. He cited the large sums of “blood money” awarded to the regime. He also raised American concerns over the deals inability to stop the regime’s uranium enrichment, the lack of access to nuclear sites, and the continued development of ballistic missile systems. He went on to appeal for a deal which would end close these loopholes, as well as one which would end the illicit funding for terrorist groups abroad and prevent the regime from interfering in the Syrian conflict. 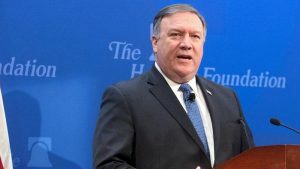 Pompeo also acknowledged the progress made by the Iranian public in its speech. He said the protests “show that the Iranian people are deeply frustrated with their own government failures”. Many of the criticisms of the 2015 nuclear deal that Mike Pompeo aired in his speech had been stated by Maryam Rajavi herself in the past. In 2013, she expressed the need for a deal which completely halted uranium enrichment and called for “unhindered access to suspected nuclear centers and facilities”. After the deal came into effect in 2015, she also warned the international community that the agreement would do little to block the mullah’s progression towards becoming a nuclear state. She also warned that the money awarded to the regime under the terms of the agreement would be misspent. She said, “Khamenei will use these funds to further the regime’s policy of export of terrorism and fundamentalism in Syria”. It seems the US Secretary of State has now publicly acknowledged these concerns.